When it comes to safety, there are no compromises. 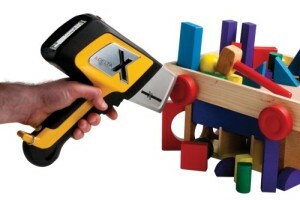 The DELTA handheld XRF is a key part of any reasonable testing program for general conformity certification (GCC). 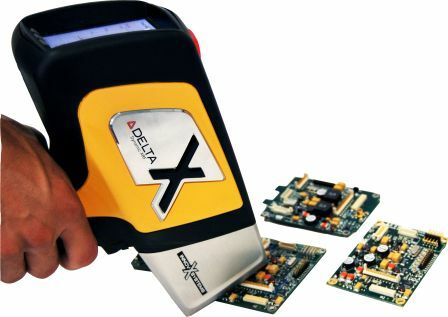 DELTA Consumer Safety Handheld XRF analyzers are used for rapid product and component screening to monitor compliance with CPSIA, RoHS, WEEE, EN71-3 and other regulations. They provide fast, accurate answers to take action. Already new elements, including nickel (Ni), are being considered for addition to the existing regulation timelines. The DELTA measures these and more too. Olympus follows the development of global regulations closely to ensure our analyzers and technology stay ahead of the regulatory requirements. Government agencies are responsible for protecting the public from unreasonable risks, such as toxicity and pollution associated with consumer products and electronics. 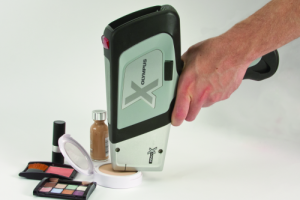 Due to their fast, nondestructive and on-the-spot screening capabilities, Olympus handheld XRF analyzers have been chosen repeatedly by the US Customs, the FDA, the EPA, the DOE and international customs agencies when it comes to rapid screening analysis of regulated toxic elements such as lead (Pb) and cadmium (Cd). 120 s test time, 3-sigma LOD. LODs shown were determined using optimized measurement settings and interference-free standards. 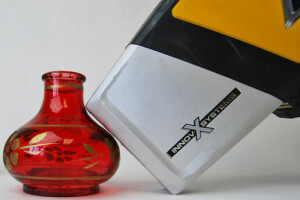 Actual “real-world” samples may contain interfering elements causing actual working LODs to be higher than those shown above. 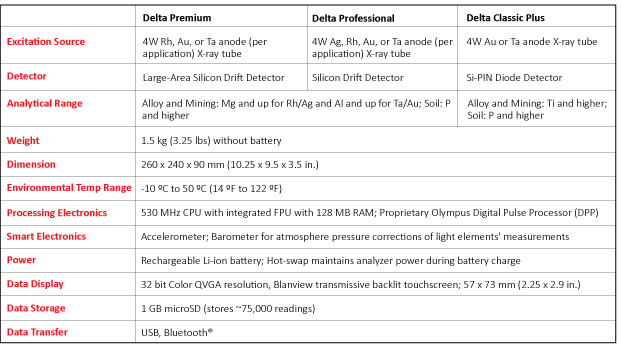 The DELTA can isolate individual components on electronics or consumer products using its integrated CMOS camera and small spot collimator. 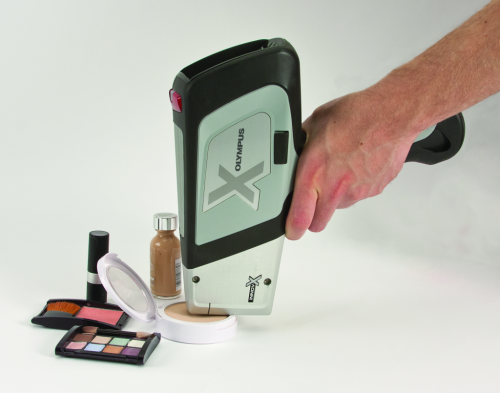 Use of 3 mm diameter X-ray spot collimation is available at the push of a button. 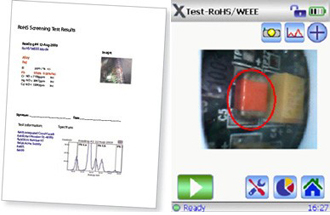 An on-screen video display indicates analysis spot, and archives sample images to memory for use in comprehensive test reports. B. 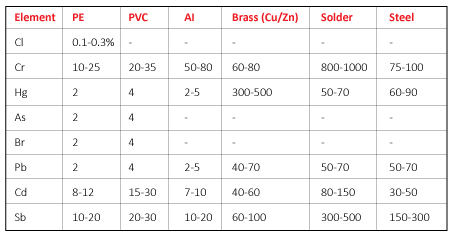 Lead in Surface or Substrate? 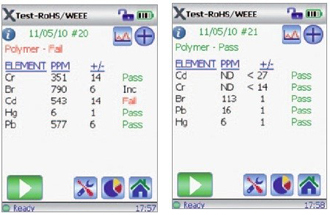 The DELTA PC reporting software facilitates immediate report generation, including analysis results, qualitative sample information, spectral information, and sample image. 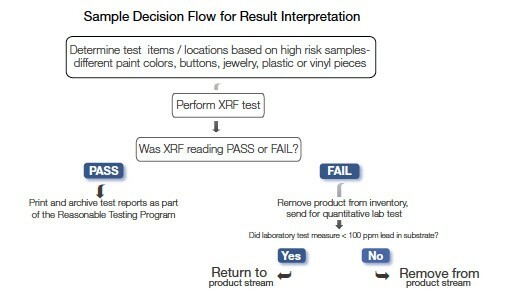 Traceable documentation makes the DELTA the ideal tool for your Reasonable Testing Program (RTP). 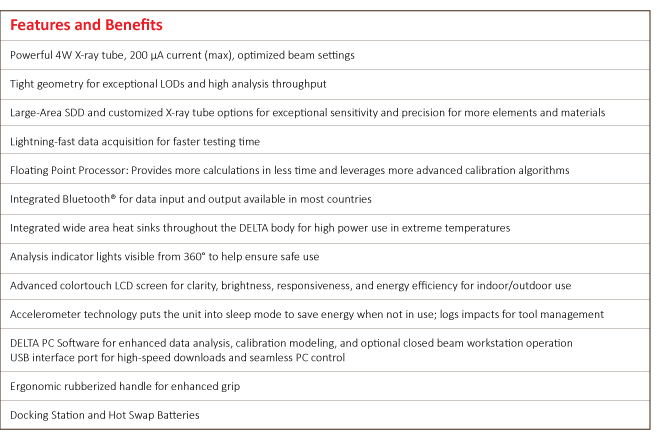 The DELTA automatically determines sample type (polymer, alloy or mixed) and optimizes measurement conditions accordingly. 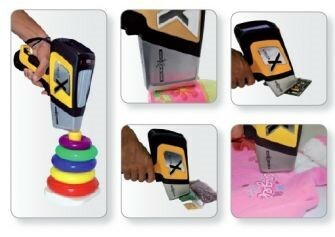 It recognizes non-homogeneous (“mixed”) samples to alert the operator, which is critical for error-free operation. 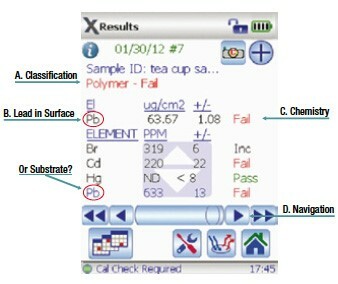 The DELTA also distinguishes Pb in the surface or in the substrate. Individuals tending to cropsGlobal advocacy groups work to uncover situations and materials that pose dangers to public health and well being and to determine a course of corrective action. For instance, high levels of lead (Pb), arsenic (As), mercury (Hg), chromium (Cr), cadmium (Cd) and other toxic metals can be found in the domicile and play areas of peoples in developing countries where the knowledge of their danger are not yet known or where regulations are simply not yet feasible. 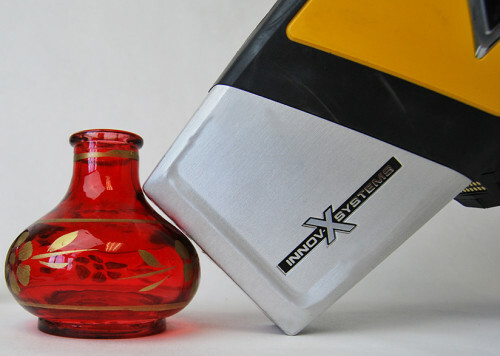 Handheld XRF analyzers are used to quickly ascertain the presence and quantity of these contaminants. This allows world health advocacy groups to determine a course of corrective action to help developing countries prosper with local resources and with safe working practices. 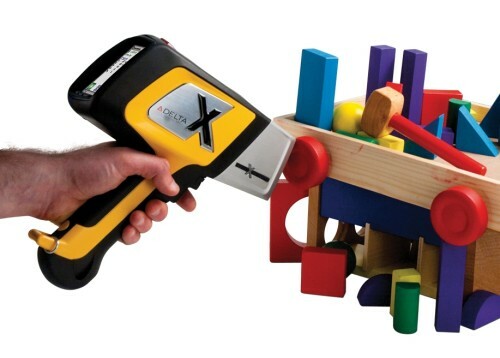 XRF analyzers facilitate consumer products safety through rapid toxic metals screening of toys, jewelry, clothing, consumer electronics and other commodities to gauge compliance with HR4040, CPSIA, RoHS, WEEE, and EN71-3 regulations. 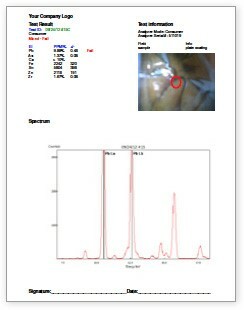 Immediate lead, cadmium, and halogen screening. 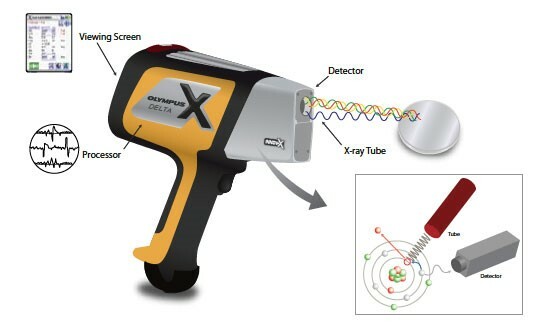 For more information on The Delta Consumer Safety & RoHs Analyzer please visit our Knowledge Center.